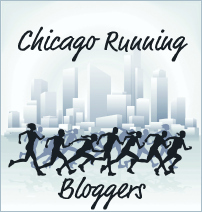 The following post is a follow up to Yesterday’s Runners and Cyclist Unite for a fellow Athlete Fundraiser Challenge. On Thursday evening fellow Athletes EMZ Eliason and McG_Christopher challenged the Athletic community. The simple challenge, hit the “Like” button on RunEmz’s photo on Instagram between 5pm-9:44pm CDT (See below). For every “Like” a .44 cent donation would be made to Aaron Edge. Who’s Aaron Edge? Aaron Edge is the Co-Founder of the Further Faster Forever Logo and in January 2013 he was diagnosed with Multiple Sclerosis. Not only has Aaron had to come to terms with his diagnosis he is also facing mounting medical bills from his treatment. 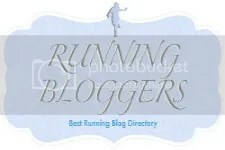 The following link is a special interview between the F3 Staff and Aaron Edge. During Aaron’s darkest moments, when he was consumed by depression and thoughts of suicide, a community of Athletes from all around the globe became one of two bright stars in Aaron’s life. The second star, and undisputedly the most important star, is Aaron’s wife. Collectively, this global community of Athletes has not only provided much needed moral support but they are going one step further by fundraising to help the Edge family with their medical bills. On Thursday night two Extraordinary Athletes put out one simple request and within hours it went viral.The request was simply to hit the “Like” button on RunEmz’s photo on Instagram. Athletes of all abilities, shapes and sizes are now united to fundraise for Aaron. In addition to the fundraising, RunEmz and McG_Christopher have also agreed to run (Number of Likes divided by 44) and bike (Final Run mileage x4) in miles the number of “Likes” generated on Instagram. 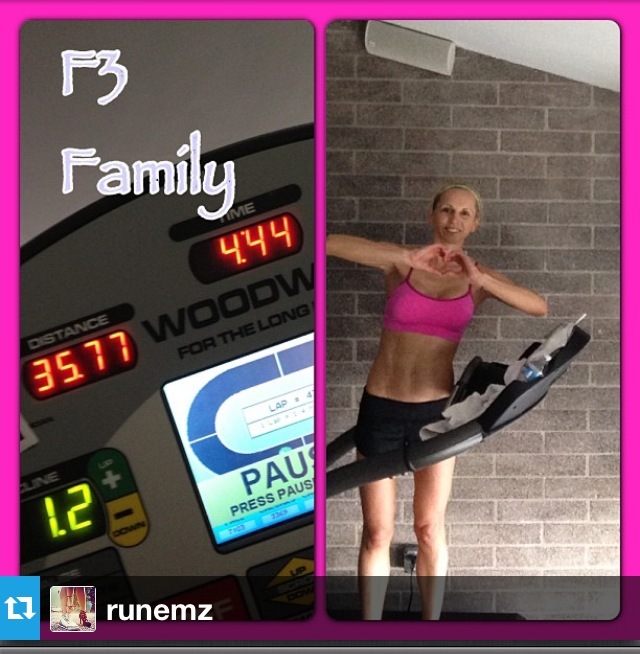 At 4:44am this morning RunEmz set off to run 35.77 miles in 4 hours and 44 minutes on her Treadmill. Christopher, biked 144 miles in about 8 hours and 35 minutes on his Trainer in the late hours of Friday night into Saturday morning. .
For those that have run on a treadmill or biked on a trainer you know how difficult just a couple of miles can be so just imagine Emz and Christopher as they are going well beyond. They are twoExtraordinary Athletes, who with the support of the F3 Community, are raising the bar to help a fellow Athlete in a time of need. My friends, in this day in age with all the various sports scandals and fallen heroes (Armstrong, Barry Bonds, Marion Jones, etc) RunEmz and McG_Christopher are extraordinary role models. They are simply athletes willing to use their special gifts to give back to strangers, to empower, and show us that all is possible even when it’s hard to see the light at the end of the tunnel. Do you want to be an Extraordinary Role Model? Then here’s a way to help Aaron Edge. For a limited time Further Faster Forever is selling a Limited Edition “When Life Deals you a Bad Hand” T Shirt. 100% of the profits from the sales will be given to Aaron Edge’s fight against Multiple Sclerosis and the mounting medical bills. Please consider a donation. When #furtherfasterforever co-founder Aaron Edge started having pain in his hands he knew that something was wrong. A few days ago Aaron was diagnosed with Multiple Sclerosis and is uninsured. We are selling this limited edition t-shirt to help with his medical bills. Also check out Aaron’s story on our blog. 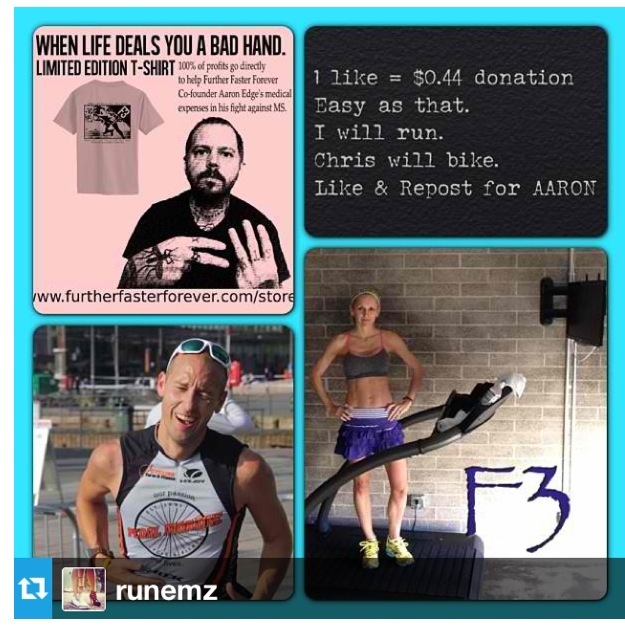 Make sure to hit the like button on @runemz instagram photo she just posted (she is going to donate .44 cents for each like and run 1 mile for every 44 likes in Aaron’s honor.) Make sure to give some love to @man_of_multnomahhe has had a pretty rough 24 hours. Head over to RunEmz Instagram Page and like her Photo. The Challenge Starts now and ends tonight at 9:44pm EST. Tomorrow: EMZ will run in miles divided by 44 for every like she gets on this photo. 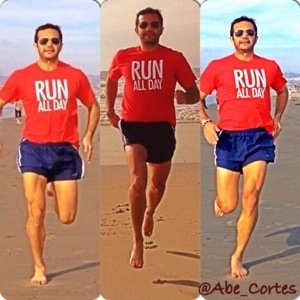 Chris, @mcg_christopher will bike in miles X4 for every like.